As I hobble into the next decade, I find myself struggling with age progression anxiety. “Oh come on now,” said my doctor, I wouldn’t consider you “elderly”. Since I had just gone through a litany of aches and pains felt in more than a few of my body parts, talked extensively about those little black dots that seem to float in front of my eyes lately, and “Yes, I said, “everything I eat gives me heartburn”, I was puzzled by her comment. I like my doctor. She looks directly at me when I am talking, nodding appropriately, but was she really hearing me? It’s kind of interesting, it seems Ross and I have moved to a location which has attracted like-aged people. As our congregation continues to grow and it is growing, the landscape of the area continues to evolve. Old Pathmark supermarkets, going out of business K-marts, and even restaurants that couldn’t make a go of it have now been turned into rehabs, urgent care facilities, and orthopedic centers. Our local hospital has expanded twice in the 15 years we have lived here. Perhaps my doctor made the remark about me not being “elderly” because she has treated patients much more age advanced than me, with more serious ailments than I have. Or, okay maybe she was just being kind. Who else, but those of us who have extensively age progressed, would be able to advise, nurture, coach and enlighten the ones who are on the road following in our well worn treads? Sadly, I’ve sometimes learned the value of the wise most when the wise were no longer here to ask. I suppose as I maneuver my way through the next 10 years, I will manage to figure it out as I go, just as I did through all the others of tens of years. My MacBook Air laptop is about ten years old. The battery is shot, so I have to keep it plugged in when I am using it. I’ve been thinking about what to replace my laptop with for about a year now. It’s a large purchase and I wanted to make sure about my decision. I always thought I would just get another Apple product laptop computer. We periodically pay the Apple store a visit. Well, Ross likes to stop in. Me? Not so much. It’s always crowded, especially since the Mac Genius to customer ratio seems to be 1 to 1. That means there are as many customer service reps as there are customers. Well, it appears that way to me. I guess that’s a good thing because one rarely has to wait for service. So, on one of these drop in’s, as I was checking out the new laptops, a Genius stopped by to ask if I needed help. She was obviously born to work in an Apple store. She was pretty tall, about 5’8”. She was dressed in pink from head to toe, including her hair. I told her that I would soon be in the market for a new laptop. “So, what do you do with your laptop?” she asked. After a brief distraction with her glittery pink eyeshadow, I explained that I write a blog, and edit my podcast using iMovie. Then Pink went into full “let me convince you that you should really consider an iPad instead” mode. 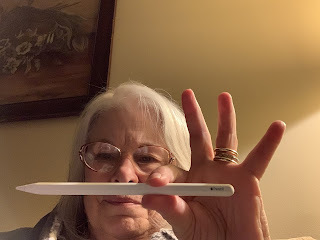 She was very good at showing me all the bells and whistles of the iPad versus the limitations of the laptop and “not to mention the prices comparison,” she said. I think the thing that sold me was when she showed me the Apple Pencil. You can’t use a pencil on a MacBook Air. My interaction with Pink happened about six months ago. Last Tuesday, I decided it was finally time to go get my laptop replacement. Even though Pink did a good job with her iPad pitch, I was still vacillating between a laptop and iPad. But, Pink wasn’t there this day. Leroy, the Genius we had this time was very nice,well informed and spent as much time with us as we needed, but, he just wasn’t Pink enough for me. He kind of left it up to me to make my choice. Once, when I was participating in a therapy group, the moderator suggested an idea for our consideration. “Change a thought, change a feeling” she wrote on the whiteboard. It sort of made sense to me at the time. At the time I would have grabbed onto any lifeline thrown my way. On Monday of this week the doctor called with the kind of news that sucked the air from our bodies. No amount of thought alteration could have changed that feeling. We have a long road ahead. More tests, more waiting for results. Perhaps months of treatments. Today I am wobbling between thoughts of despair and feelings of hope. Once, when I thought that my feelings would overwhelm me and command me to despondency, someone suggested I write. During the last seven years, this space has been my safe place. It’s here I come to explore and express all of my feels and thoughtfully send them on their way. It’s the lifeline that makes most sense to me.